Primary Care and Chiropractic believes in the value of chiropractic care for you and your family toward the goal of achieving total health and wellness. Therefore, we have created a pricing structure that is flexible enough to allow you to get the chiropractic care you need, no matter what your budget. Our chiropractic office participates in most insurance programs, but please call us at 303-683-3377 if you have any questions about whether you can use your insurance to pay for your chiropractic care. We also accept auto accident and workers compensation cases that result in back pain, headaches or other symptoms which can be addressed with chiropractic care. For patients who have little or no chiropractic insurance coverage, flexible payment programs can be arranged. To learn more about our payment options for chiropractic and wellness care, you can call our Highlands Ranch chiropractic office directly at 303-683-3377 and one of our friendly staff will be happy to answer all your questions. Chiropractic treatment is covered by your insurance when the care is directed by a physician for a diagnosed medical disorder. If you choose to have your treatment covered through insurance, a brief examination will be given by one of our doctors to determine the type of chiropractic therapy to be implemented in your personal case. 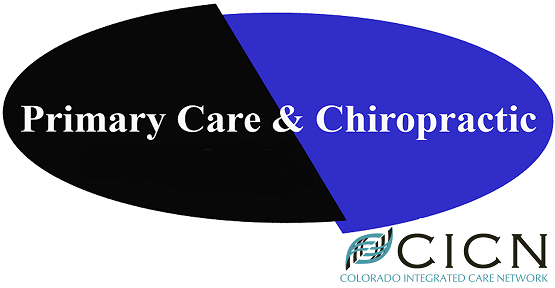 Primary Care and Chiropractic is part of a large network called Colorado Integrated Care Network (CICN). As a member of Colorado Integrated Care Network, we are able to offer a greater range of insurance covered services, which means your insurance covers more of the services we offer. Due to this, your insurance explanation of benefits (EOB) will now contain Colorado Integrated Care Network or South Metro Integrated Clinic and the name of our assigned medical director, Michelle Smith, MD. The implementation of the network will consist of a thorough examination in our office by one of our doctors to assess your present symptoms, as well as an evaluation of your past medical history. This information will then be evaluated by our medical director for determination of your medical necessity and appropriate treatment protocols. Please be aware that some billing codes that you will see on your EOB will be higher due to the fact that not only are you being managed and treated in this office chiropractically , but you are being medically managed as well. If you have a high deductible, you can decide at your first visit to be cash or insurance and indicate that with our front desk. Once claims are sent out, we cannot retract the insurance charges. Our goal at Primary Care and Chiropractic is to allow everyone to experience the benefits of chiropractic care. For patients who have little or no chiropractic insurance coverage, we can work with you to arrange a flexible payment program that fits your budget. If you have no insurance or if your insurance does not have any chiropractic benefits, there are still ways for you to receive the pain relief and chiropractic care that you need. Many patients choose to pay directly for their visits with the chiropractor, especially as they discover that chiropractic care is actually extremely cost-effective and affordable. For these patients, chiropractic care is often cheaper and more effective than alternative pain treatments such as pain medications or invasive surgery. Our focus at Primary Care and Chiropractic is to actively help you and your family in taking responsibility for your total health, wellness, and disease management. Our chiropractor will assist and guide you as you take the time to care for some of the most important people in your world: you and your family. In an effort to make living the wellness lifestyle as easy and affordable as possible, we can create a customized family chiropractic plan that is specific to you and your family. At Primary Care and Chiropractic in Highlands Ranch, we are convinced that chiropractic care will help you stay healthy and pain-free, using only a small amount of your time and money. Our chiropractic health professionals will help you care for your most important asset--your health. We truly believe the prevention is the best cure, and regular chiropractic care will be far less time consuming and expensive than trying to recover from pain or an injury after it's happened. If you feel you do not have enough time or money to take care of yourself, please contact us at 303-683-3377--we can help! The last thing we want is for you to come to our chiropractic center in crisis. So please, we would like to encourage you to take your health very seriously. As the old saying goes, if you don't have your health, you don't have anything. Unfortunately, too many people don't discover how true that statement is until it is too late.